The frameless alternators consist of a fixed part or stator and a rotating part or rotor. The stator is constituted with an external housing made of aluminium alloy bearing the magnetic laminations and the three-phase winding as well as the power cabling and the thermal sensors cabling. The winding heads are encapsulated in a resin with the aim of protecting them and decreasing their thermal resistance. The outer surface of the stator housing can bear outdoor environment except in specific cases of salty atmosphere where an external enveloppe is recommended. The rotor consists of a steel rotoric hub used as a magnetic yoke on which the rare earth permanent magnets are fixed. The magnets are originally phosphatized and additionally coated with an anti-corrosion varnish. 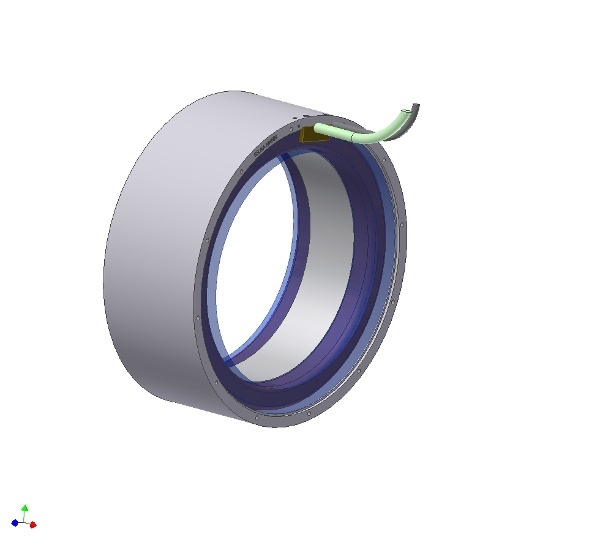 The rotoric hub is protected from corrosion by a layer of grease. - the stator bears a peripheral centering diameter ØB and a centering diameter ØA on both sides. 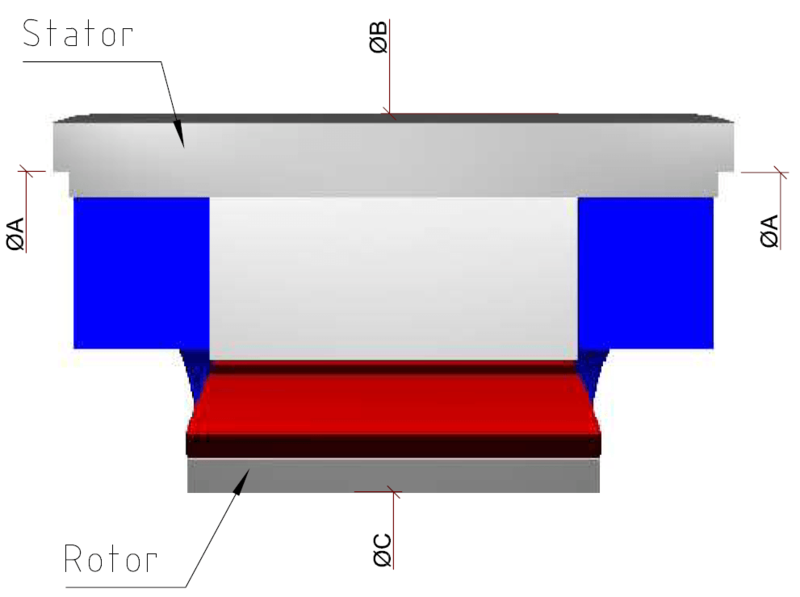 - The rotor bears an inner centering diameter ØC. - Stator and rotor fixing are made through threaded-holes on both stator and rotor sides. - The stator and rotor are delivered as two separate parts, the rotor is not fitted inside the stator. Hence the user has to mount, center and align the 2 parts. - Optionally, the frameless alternator can be delivered with the rotor and stator, mounted, centered and axially aligned on a specific FMDT mounting flange (see Handbooks for STK assembly). Caution, the FMDT mounting flange is only a tool to be used for an easier assembly. Once the rotor and stator secured and coupled to the turbine, the FMDT flange will be disassembled. - exceptional compactness, power-to-weight and power-to-volume allowing the operation of wind turbines in direct driving without speed multiplier: up to 600 W/Kg of alternator and 2500W/dm3 of alternator. - Highest reliability and lifetime: MTBF of 100,000 hours and more can be considered in standard applications. Selecting the rotary speed: for a given power, a PM alternator will be smaller, hence cheaper , if the rotary speed related to that power is higher. As a matter of fact, the alternator size is not defined in a first approach by its rated power but by its rated torque. Therefore, for progressing towards the most cost-effective version, the wind turbine designer will have to define its rated operation point at the highest possible speed, provided that it will be compatible with an operation in direct driving without this use of a speed multiplier. 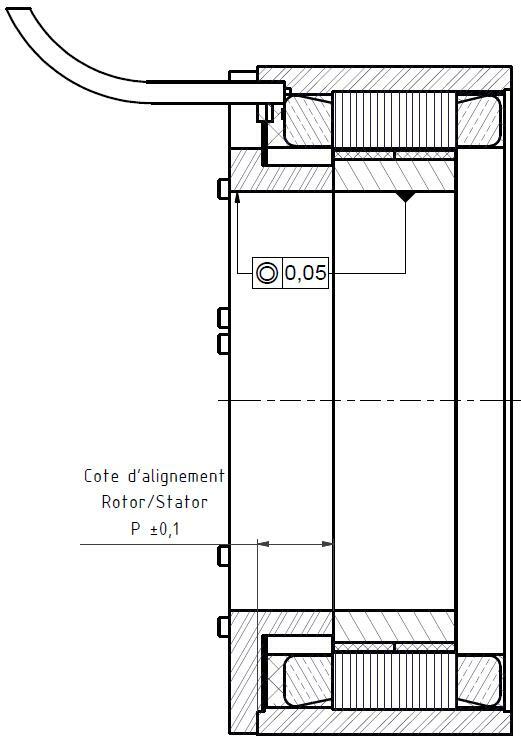 Let’s take the example of a wind turbine specification with an output power around 6 KW that could be delivered in a speed zone undertaken betwen 250 and 350 rpm. Two alternators could be envisaged in the ALXION catalogue: 300STK4M delivering 6.6 KW at 350 rpm with a weight of 31 Kg and 400STK3M delivering 6.6 KW at 220 rpm with a weight of 46 Kg. The 300STK4M will be chosen because it is smaller and cheaper than the 400STK3M. In the fight between horizontal and vertical axis wind turbines, it is commonly admitted that the latter rotates at lower speed. Hence, for a given power, the alternator will be more expensive in the case of a traditional vertical axis wind turbine. However, due to their specific applicative features, the vertical axis wind turbines will be surely selected in an urban environment or for being installed on a building. Frameless alternator mechanical integration: since the compactness and the efficiency of the STK alternators open the way to the design of wind turbines with alternator in direct driving on the main axis without the need of a speed multiplier, one should optimize the wind turbine structure for making it simpler, more reliable, and more cost-effective. Why, indeed, would it be envisaged to install a complete built-in alternator with its own bearings, its flanges, its shaft and all necessary parts for interfacing with the wind turbine frame and its main axle if a frameless rotor/stator alternator kit can be easily integrated by minimizing the number of bearings and the interfacing parts as well as the related multiple alignments and eccentricities? Thanks to the availability of the STK rotor/stator alternator kits, it is now possible to directly couple the rotor to the main axle. 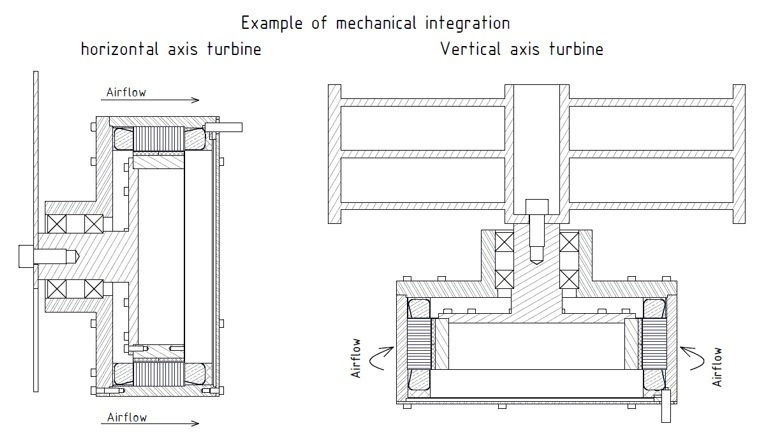 The main axle bearings of the wind turbine can bear the alternator rotor on the opposite side of the blades, provided that the guiding insured by the main bearings would be sufficiently precise and also that the mechanical integration would be sufficiently precise for ensuring a safe airgap to the assembly. 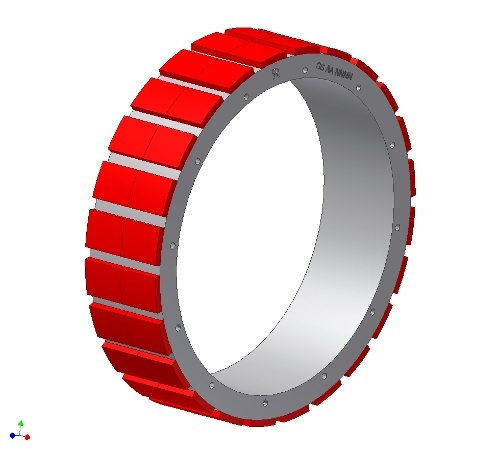 The peripheral outer surface of the alternator stator can be directly in the wind flow and is directly fixed to the main flange forming the bearings box of the wind turbine. In that case, a simple rear cover without accuracy is needed for closing the device. One should insure the correct tightening for the internal part of the alternator. It is therefore possible to make a simple alternator integration by minimizing the number of mechanical parts and interfaces. However the design of mechanics for integration has to be sufficiently precise. The prescriptions related to the integration of STK kits are given in the Handbooks for STK assembly related to each range. Six ranges of STK frameless alternators are available and they are characterized by their external housing diameter: 145STK, 190STK, 300STK, 400STK, 500STK, 800STK. The part number of each model mentions afterwards the digits XM whereas X can be equal to 1 to 9, depending on the range. The symbol XM represents the number X of magnets rows borne by the rotor in axial direction. Regarding ranges 145, 190, 300, 400, 800, one can note the presence of data in the tables, only related to even values of X (except 400STK3M, very widely used alternator, 300STK1M, 500STK3M and 800STK1M); however, models with a noneven X also exist; they were not mentioned in the table for catalogue clarity. The related rated powers can be interpolated between 2 following even XM models, in first approach. The complementary data regarding the XM models with noneven X can be requested to ALXION. However, the dimensions are given in the related tables of the catalogue for both even and non even X. For each XM model, 2 different versions are mentioned an the catalogue and they are characterized by 2 different rated speeds. Those 2 versions only differ by their winding and their output cabling. As a matter of fact, the principle is that the rated voltage at rated speed and rated power would be around 230 V ac phase to phase. At the highest rated speed, the rated power is higher and, as the voltage at the rated operating point is the same for both versions, the rated current for the higher speed version is therefore higher. Let’s take the example of 145STK4M, presenting a winding version for 650 rpm and another one for 1500 rpm. The 650 rpm version delivers a rated power of 1307 W at 3.2 A meanwhile the 1500 rpm version delivers a rated power of 3389 W at 8.0 A. - the load is considered as a resistive one with unity power factor and sine wave voltage. The rated power relates to the maximum electrical power that can be delivered in continuous operation, at stabilized temperature, by an alternator driven at the mentioned rated speed. Those curves plot the maximum electrical power that can be delivered in continuous operation (Pr) at the related speed by an alternator driven with the needed input torque (Tpr), when considering a windflow of 10 m/s cooling the housing, an unity power factor, a sine wave mode and an ambient temperature of 40C. One should point out that it is not a curve of transient maximum power but a rated continuous power curve. For delivering the rated power mentioned on the catalogue, if the load allows to do it, the input torque transmitted to the rotor of the alternator, that is to say the torque transmitted by the blades axle, has to be equal at least to the input torque, also mentioned in the catalogue. For illustrating, one can consider the frameless alternator 400STK3M that will deliver a continuous rated power of 6594 W at 220 rpm (if the load allows it) provided that the input torque would be equal to 347Nm minimum. The wind turbine designer wil have therefore to check that the blades are correctly sized for applying that torque. 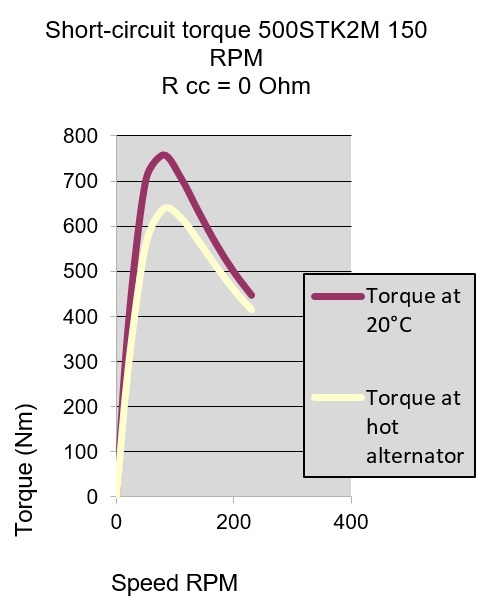 In addition to the 2 values of input torque at rated power, one at rated speed and the other at half speed, mentioned in the tables of characterics, the curves of input torque (Tpr) at rated power (Pr) vs rotary speed are supplied for all models. Two points of efficiency at rated power are given in the tables, one at rated speed, one at half speed. The curves of efficiency vs speed are parametrized according to 3 levels of input torque: input torque at rated power or Tpr, half torque Tpr/2, one fourth of torque Tpr/4. One can note that the maximum efficiency is generally not obtained for torque at rated power Tpr, but at a reduced level of torque. The electrical frequency is given by the relation f = p * N whereas p is the number of poles pairs and N the number of revolutions per second. Caution: the number of poles is obtained by multiplying per 2 the number of poles pairs. Thus, for a 400STK3M mounted on a wind turbine having to operate on a rotary speed band from 70 rpm to 220 rpm, the electrical frequency varies from 14 Hz to 44 Hz. The resistive torque existing for rotating a PM alternator at no load is called « cogging torque ». 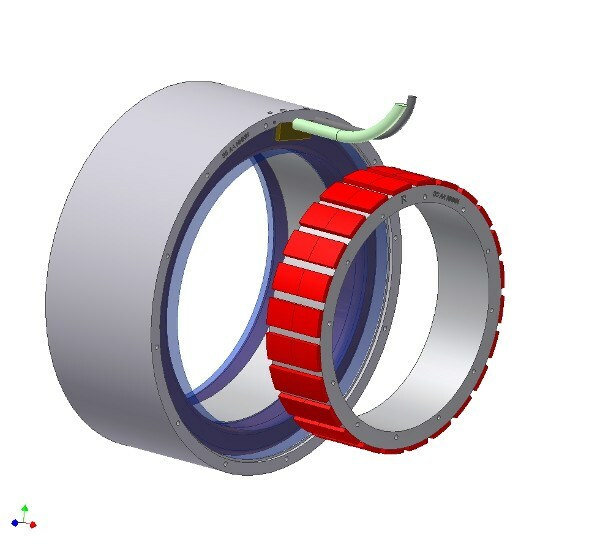 That torque can be considered as a « magnetic friction » torque; it comes from the interaction between the magnets borne by the rotor and the toothed statoric laminations housing the windings. The STK frameless alternators have the benefit of an extremely low cogging torque coming from the magnetic design itself, limited percentually around 1% of the rated torque. That original technology directly comes from ALXION STK servomotors used, in particular, in the CNC machine-tools where the lowest speed ripple at very low speed is requested, in order to guarantee a micrometric dynamic tracking error on the most precise grinded parts. Our STK frameless alternators catalogue mentions the typical cogging torque related to each model that can be subject to dispersions around that value. Thanks to their extremely low cogging torque, the STK alternators start and begin producing energy with lowest windflows. The STK alternator is a 3-phase machine with a voltage varying according to rotary speed, load (current) and temperature. - Voltage at rated load: this is the voltage delivered at the rated operating point (rated power and rated speed), hot alternator and unity power factor. As it has been already mentioned, that voltage is around 230 V ac line to line, on the standard catalogue models. - Back Electro-Motive Force (back emf) at 20°C: this is the voltage at no load and rated speed for an alternator at 20°C. That voltage is directly proportional to speed. The voltage at no load, or back emf, is the highest voltage delivered by the alternator at a given speed; when the alternator is loaded, that is to say when electrical power is delivered, its voltage is always lower than its voltage at no load or back emf. Let’s take the example of 400STK3M in 220 rpm winding version; the voltage at rated power is equal to 247 V line to line. The voltage at no load or back emf is equal to 330 V. If the user wants to start producing energy from 70 rpm (1/3 of rated speed) up to 220 rpm, the minimum phase to phase voltage will be reached at 70 rpm with a value of 70/220 * 330 V, that is to say 105 V and the maximum voltage will be delivered at 220 rpm at no load, when no power is delivered, that is to say 330 V.
Windings with specific voltage levels can be made upon request; in the same way, rated powers and speeds different from the ones mentioned in ALXION’s catalogue can be envisaged with eventually different rated voltage: please contact ALXION. The curves of voltage plot the voltage at no load for a cold alternator at 20C as well as the voltage at rated power vs rotary speed for the 2 versions of windings given in the catalogue, one « low speed » and the other « high speed ». Limit of voltage: the alternator can rotate at a speed higher than the rated speed mentioned in the catalogue provided that the voltage at no load would not exceed an amplitude around 500 V. Let’s take the example of 400STK3M in 220 rpm winding version; its voltage at no load is 330 V at 220 rpm. One will take care that the maximum operating speed would not be higher than 500 / 300 * 220 = 333 rpm. The former statements evidence that the electrical frequency changes according to speed and that the alternator 3-phase voltage has a considerable variation according to speed, load and temperature. In order to perform applications of battery charging, one will therefore introduce an electronic converter interfacing betwen the alternator and the batteries, making the following conversion: Variable AC voltage/ Fixed DC voltage. Let’s mention that some of our customers use, in particular, the electronic converters from POWER ONE, www.power-one.com. For performing a grid connection, the electronic converter interfacing between alternator and grid will be more sophisticated, by making the following conversion: Variable AC voltage/ Fixed DC voltage/ Constant frequency and AC voltage. Most of the wind turbine aplications use rectifier+ inverter electronic converters, in particular products from POWER-ONE, www.power-one.com. In some cases, they use regenerative electronic drives (allowing an operation in motor and alternator) constituted with 2 inverters in order to control the torque and minimize the noise. It is recommended to consult the application note about ST and STK torque motors about the latter issue. It is possible to short-circuit the alternator phases in order to get a braking torque. CAUTION: the short-circuit must be made exceptionally, in non-repetitive pulse-mode only. The braking torque varies according to the load impedance: non-impedant short circuit or impedant short-circuit through resistors. Moreover, the braking torque exists only when the alternator is in motion; at stall, the torque is null. Therefore, a strategy of phase short-circuiting should constitute in no way an alternative to the use of a mechanical brake. - Winding thermal security by means of PTC resistor: ohmic value lower than 100 Ohm for acceptable temperature; ohmic value higher than 1300 Ohm from 160°C threshold (maximum acceptable winding temperature).